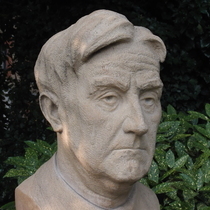 Ralph Vaughan Williams O.M. lived at 13 Cheyne Walk 1905 - 29. Years of the Sea, London and Pastoral Symphonies; The Lark Ascending; Fantasia on a Theme by Thomas Tallis; Sancta Civitas and other works. Unveiled by John Gilhooly, Artistic and Executive Director of Wigmore Hall and Chairman of the Royal Philharmonic Society.